Lot of 2 Hohner Harmonicas in original cases Both in fine condition. One is a Blues Harp key of F. The other a Marine Band key of D. Made in Germany. THIS HARMONICA STYLE HAS BEEN AROUND OVER 100 YEARS AND WAS USED BY MANY FAMOUS STARS. THIS HARP IS IN THE KEY OF D. YOU WILL ENJOY PLAYING THIS GREAT HARMONICA. HOHNER MARINE BAND. REEDS: 20. COMB: PEARWOOD. This harmonica is in excellent condition. Appears to be never used. In its original box. Made in Germany. AUTHORIZED HOHNER DEALER!!! FREE US SHIPPING!!! Vintage M Hohner Marine Band Harmonica No 1896 with Case Key D. Shipped with USPS First Class Package. Harmonica is in good used condition. It does have some blemishes from age. Please view pictures for flaws. Harmonica and case in "like new" condition! We are very easy to get along with. Get images that. Hohner Special 20 key D Marine Band Blues harmonica great condition with an original Hohner light brown hard case. The harmonica had been disassembled and Detailed Cleaned. They buy and you play and no need to worry about cleaning. Type: diatonic. 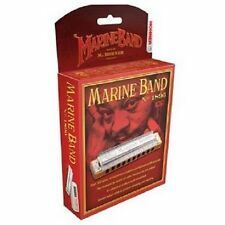 The Marine Band 1896 is the archetypal blues harmonica. When you discover this piece of living musical history, you won’t just play the blues. You’ll feel the blues. Type Diatonic. SKU: MARINEBAND-D – Manufacture: Hohner. For sale a Vintage Hohner Special 20 Marine Band Harmonica Key D Made in Germany. Good condition. Please view all photos before buying. Good used condition comes as pictured with the original box and paperwork. This is an estate purchase. Will be sold as is. See pictures for more info. In good condition. Please contact me with any questions or concerns. A lot of six Hohner Marine Band Harmonicas. Includes keys of A, B, B-flat, C, D and E. I believe two of these, the C and E are pre-war as they bear the star in the logo. The E box is rough and missing the lid, the hinge of the C box is separated. Harmonicas look nice overall. We did not play these much but they do seem to have a good sound. 010419 - FE. The one, the only, the original—the Hohner Marine Band is the harp that was there when harmonica blues was born. Made famous when played by every serious harmonica player from Little Walter to John Lennon, Paul Butterfield to Bruce Springsteen, Neil Young and many, many more. The archetypal blues harmonica with the traditional HOHNER tuning. The Marine Band is the original blues harmonica. Its uniquely authentic sound has defined the role of the harmonica in the blues tradition and made it the benchmark by which all others are judged.